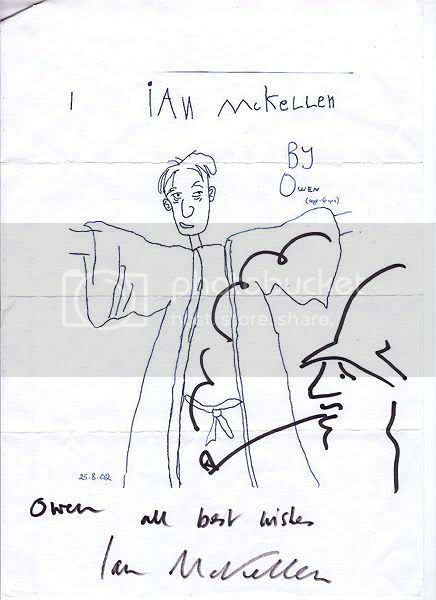 This was the drawing my youngest son sent to Ian McKellen. It has come back, signed by Sir Ian AND he has drawn himself as Gandalf on it!!! omigod, that is so cute! How lucky for him! Do you mind if I link people to this post? Because this *needs* to be seen. Sir Ian is so cool! I loff him! Sir Ian rocks my socks. He's such a sweetheart for doing that for your son. *loffs Ian* Absolutely incredible. Ooh Ian is so nice! And your son did pretty darn good for his age!! Wow! It's evident that the talent runs in the family, luv! That's a great job by your son there! And Ian... wow! That's totally cool! Woo, how cool! Sir Ian rocks. Came here via a mutual friend, obviously. How incredibly sweet and wonderful! yay to Owen and yay to Ian McKellen!! !